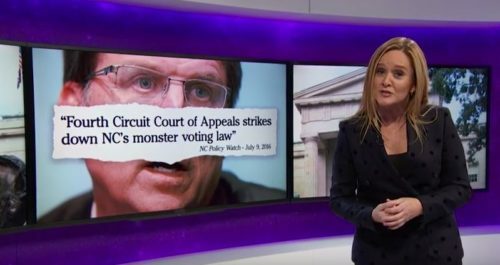 Samantha Bee continues her role as America’s pissed off conscience on Monday nights, going after Donald Trump and North Carolina’s former governor Pat McCrory, as well as Jill Stein, for demeaning confidence in the electoral process. One of the great myths the Republicans are working hard to prove, in spite of a lack of evidence, is that voter fraud is a serious issue which must be addressed with restrictive voter I.D. laws. Laws which just so happen to result in the disproportionate disenfranchisement of minorities and low income citizens. While absentee ballots appear to be the most common source of what little fraud exists, according to an investigation by Frontline, most states with voter ID laws do not apply them to those mailing in their vote. Absentee voters tend to be older and whiter than those who vote in person. Bee points out, through a PBS report, that the North Carolina State Board of Elections has referred only four cases of alleged voter impersonation to prosecutors between 2000 and 2015, with none resulting in a conviction. North Carolina passed voter laws so restrictive and so obviously racially biased that they failed to stand up to legal scrutiny. It became a lead example of the consequences of the Supreme Court ruling in 2013 to allow nine states, mostly in the South, to change their election laws without prior federal approval. But even those efforts couldn’t keep McCrory in office, ousted amid demands for a recount and claims of voter fraud. Claims he continued to make even in his concession speech. Or, as Bee suggests, maybe the state went for Trump but not McCrory because the anti-LGBTQ bill he signed into law, House Bill 2 (HB2), cost the state millions of dollars and hundreds of jobs. McCrory, or “Sheriff of Toilet Town” as Bee calls him for his signing HB2, which requires trans people to use the bathrooms matching the gender on their birth certificate, is bested in lack of grace by a man he rallied with throughout the campaign, president-elect Trump. Bee then takes aim at Stein and her recount efforts, for which she raised millions and which are going even less productively than expected. Which is saying something, since Stein herself admitted it was unlikely to change the outcome of the election. “Liberals, I know you only gave her money because you thought she’d take off with it and never come back and we all want that, but instead of using your money to undermine democracy, why not participate in it?” Bee asks, encouraging people to instead give their money towards efforts to help Foster Campbell win his Senate runoff election in Louisiana. “Remember, state elections come down to a handful of votes,” Bee concludes. “Just ask this loser,” she adds, a picture of McCrory appearing.